The history of the Mercy Sisters, built on the vision of Venerable Catherine McAuley and rooted in her spirit of empathy and compassion, “is a long and very proud one”, President Michael D Higgins said on Thursday. Marking Mercy Day, the President opened ‘The face of Mercy Today’ photographic exhibition and said this proud history had led some to establish the Mercy International Association twenty years ago. It is now the heritage, hospitality and spiritual centre for the worldwide Mercy Community, which is active in 42 countries around the world. 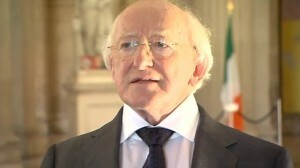 Known to the Mercy Sisters as “a place of pilgrimage and renewal,” President Higgins said Catherine House was “a house of welcome and hospitality”. This centre extends a hand of support, a point of welcome and is a focus point for making a return and a reconnection, for the Mercy Family worldwide, the President said. In his address, President Higgins said that nationally, it is widely recognised that Irish missionaries led the way for much of what the Irish Government, through Irish Aid, is now doing in the area of development assistance. “The partnership with missionaries is of real importance in the achievement of our Government’s overseas development objectives,” he commented. Referring to the representatives from all ten Mercy Associations who gathered in Dublin for the special anniversary, he wished them well in their discussions of the critical issues relating to development through Mercy Global Action. 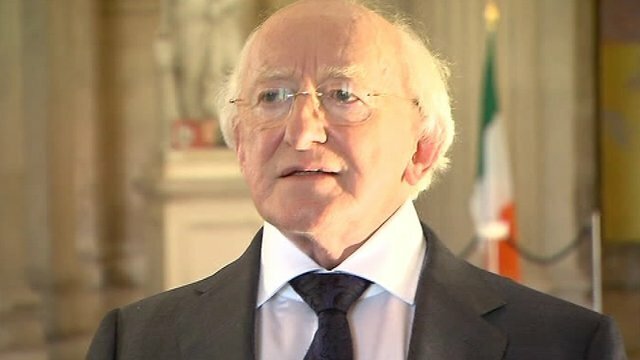 The President also paid tribute to the impact of the Sisters of Mercy in Ireland had had saying that through their work they have long been “woven into the very fabric of our society”. “In fact, at one time the Sisters were so visible on our streets, visiting the sick and engaging in other works of care and compassion, that they were known as the ‘walking nuns’,” he recalled. Acknowledging that many Irish people owe their early education to the Sisters of Mercy, he said generations of Irish citizens have been profoundly grateful to the Mater Hospital, founded by the Mercy order in Dublin, for the excellent care they or their loved ones received there over many years. The Sisters of Mercy have also been part of a larger global family engaging in missionary work across the world, he praised. “They did so, and continue to do so, with such an assiduousness for justice and equality as has enabled them to ensure lasting change for some of the most marginalised and vulnerable communities in the world,” said President Higgins, who was greeted at the ceremony by his cousin Sr Gabrielle Ryan rsm. By coming together as one compassionate and determined voice of Mercy, to advocate for a more just and equal world, the power of what you do is immeasurable, President Higgins said. He said their focus on sustainable development, human trafficking, and the achievement of co-ordinated responses to global catastrophes addresses some of the greatest modern challenges facing the global community.